New podcast up, featuring @birdman caw! As always, the feeds will take a bit of time to update for subscribers. Great cast guys. Thought it was a bit overly meta to begin with but went much better later on. Feel like there should be way more chat in this thread because these podcasts are one of my favourite things. Any recommendations of topics you'd like to hear discussed? Or if there's a different format we could be doing other than interview/discussion. I'd love to do a Care-Tags Podcast Quiz Show. UnwashedMolasses wrote: Care-Tags Podcast Quiz Show. @hmwut i guess this means we fight to the death? I had a long drive today and I didn't put these on my iPod. Regretted it the whole time. @schiaparelli and @hooplah talking about graphic design in fashion or something? Strong upvote on botany x fashion. UnwashedMolasses wrote: I'd love to do a Care-Tags Podcast Quiz Show. Only if we get to shout "YOU FOOL!" if they get it wrong. episode 12 up. We talk about the whole normcore thing with my friend/former trend forecaster/fellow hipster Kathleen. enjoy and thanks to Kathleen and all the usual suspects. Last edited by thatbiglake on Mon Nov 13, 2017 12:38 am, edited 1 time in total. Last edited by thatbiglake on Mon Nov 13, 2017 12:37 am, edited 1 time in total. Just started on episode 1, now I have something to listen to for a bit. I'd maybe be game to do one in the future now, by the way. Doing a huge amount of non-creative admin today and picked this up again. Just got through the @odradek ep which I thought was superb. I completely agree with most of what was discussed. It isn't just clothing either - creating experiences around any product changes it from an object (functional or not) to something with some personal investment. Even something as supremely functional as a new smartphone or computer is only the sum of its parts on day 0. It's no secret that I feel that way either, which is why I/we try and instil some experience into things we make before you even buy the product - because we can't take you with us and we sadly can't code your first kiss, a great day, or emotional attachment into the construction. Whether that's interesting to anyone is another matter - but I recognise in myself that I place greater investment in products this way and end up buying them, using them, and taking more care. We named the brand in part with the hope that once pieces leave us they'll have their own story and will be well loved and might even end up inspiring someone 50/60/70 years later to remake it the way we have with vintage pieces. But I agree with the wider point that no matter how cool or coveted a shirt is - it's just a shirt. On the point of print and digital being 'pretty much the same' in that you still contact PRs for shoots and all that: yes and no. I think this really just depends on what level a publication operates and that actually PR and Marketing houses are still operating in the same (bad, old) way with publications that have just gone from being on paper to being online without fully realizing the difference. For smaller publications or smarter ones online is WILDLY different, more reactive, more widespread and shifts power to the readership over sponsorship. When I worked in print we would have days, weeks or months to put together a volume - now we have hours. Shoots still take the same amount of time to organise I suppose but distro is totally on its head. 2. RE: The Brits in charge - can't help but feel that brits in general are more meta and analytical. I think we're the same about how we view our own society and I have always felt like we/they are culturally detached. She sounds like she has it worked out. When you work in media for a while you start to wonder whether the dog is wagging the tail or the tail is wagging the dog because of the reliance on sponsorship. 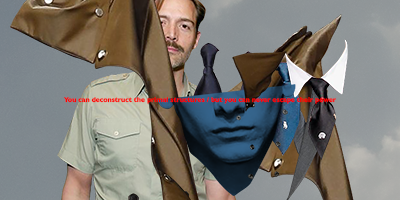 New podcast with @rosenrot joining @teck and @unwashedmolasses to discuss Commes Des Garcon is up! Many thanks to @UnwashedMolasses, @teck and @rjbman for giving me the opportunity. Just wanted to make a couple of corrections to my statements. I just found a CdG garment with partial silk content recently, though not full on silk, and when I said CdG doesn't do branding, what I meant was advertising. This was my favorite episode of the podcast yet, I think A LOT of people that are into CdG or other similar houses/designers have a similar history to their relationship with the brand as you guys described. The first few times you see some of the designs it's hard to actually contextualize your feelings in any sort of way other than likely focusing on how unpractical/wearable/what have you it is. In a lot of ways, (I think one of you in the podcast used this word, which I thought was the perfect description) it assaults our ideas of what clothing and fashion should be and how it should function in the world. But I think if you approach it with an open mind it ruins you to a lot of the more readily available design in the world, and that's when you find yourself investigating it more and...if you're like me, probably becoming obsessed with it. Of course there will always be people whose initial negative impressions of the brand don't change, and that is fine as well. Hey guys! New podcast is up, featuring @soundclip989 and @exprof discussing thrifting. i'd like to do another if you'll have me. with better sound on my part. can we (the care-tags community) do some version of "shownotes" for the podcast with a limited, 'curated' number of fits, face and non-face photos for the interviewee(s) and links to any relevant internet websites, forum threads or personages mentioned. i'd be happy to do it but i'm pretty nu here so maybe someone with more forum prestige (inside the c-t inner sanctum) should do it? Something funny with this show and the rss feed?? My podcast listener app didn't pick it up. been working fine on my podcatcher app too. I use player fm on android. I'd try removing the feed and then readding it. BOBBIN>THREADBARE: Wow that is a top achievement! Well that's all folks, until next time! TECKNEAKS: Hi it's me Clive "Don't sweat the" Teckneaks live from Nu York Nu York, so great they named it twice (private in-joke har har don't mind me). With me today i have Dries van "Syeknom" Noten, celebrated belgian commutator, and Bela "Tamwar Masood" Bartok, polymath extraordinaire. BELA BARTOK, COMPOSER: Taper? I hardly know her! Just a reminder, these happened. Update on podcasts: between me, @teck, and @unwashedmolasses, we've been caught up with life. Trying to get another one going, it's in the planning stages!